27 wooden dowels of differing thickness (small, medium and large and different colours (yellow, red and blue) are placed within a wooden ring and then twisted so they balance on the table. 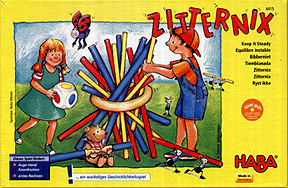 Players roll a coloured die which determines which dowel they must remove from the ring. Each dowel has a point value from 1-3 depending on the colour/thickness. The player with the most points when the structure collapses is the winner.